This post is the result of a casual conversation with one of our engineers. About couple of months ago, he happened to mention that if we ever got around to refactoring some code in one of our systems, using JPA for database persistence would be preferable instead of JDBC, as we do currently. I did not know much about JPA at the time, except that it was something to do with EJB3 and Hibernate, so I decided to read up about it. Turns out I was only partially correct. JPA is an API which is implemented by various popular ORM implementations such as Toplink from Oracle, Kodo from BEA, Hibernate from Redhat's JBoss group and OpenJPA from Apache. In a sense, JPA is to ORMs what JDBC was to databases. It provides a common API to work against multiple ORMs, so developers need to learn one API to work against any JPA compliant ORM, and a company could (at least in theory) switch between ORM providers without changing any source code. Based on previous experience with coding against Hibernate 2.x, I think JPA code (using Hibernate) also looks much simpler. One book I found very helpful was Chris Maki's "JPA 101: Java Persistence Explained" from Sourcebeat. Its available as a PDF eBook and is fairly reasonably priced, and contains almost no fluff, unless you count the first chapter, which deals with setting up the example application using Eclipse and Maven, which probably most (but not all) developers would be familiar with. However, the book has plenty of examples and is very readable. I would recommend it strongly if you are trying to get started with JPA. After reading the book, I realized that the engineer's suggestion was pretty much spot-on. In particular, I liked the concept of implementing the application's object inheritance hierarchy directly in the database, which I describe below. The ModelBase class is something that is needed by JPA, and its convenient to set up a single one that enforces on the correct id class (for the given database) for any persistable bean in the application. 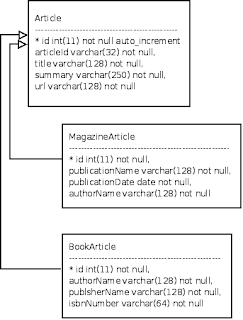 The Article class specifies the properties we would always extract, regardless of provider, and the MagazineArticle and BookArticle specify the metadata unique to each provider. Notice the absence of the discriminator column in the Article table above. I spent nearly a day trying to figure out what I was doing wrong before I found that Hibernate, unlike other ORM implementations JPA covers, does not need to use the discriminator column for JOINED inheritance, and hence apparently has no plans to conform to a standard it considers broken in this regard. It does not affect me that much since I plan on using Hibernate anyway, but while I am no expert on these things, I think that this strategy may harm Hibernate's adoption by big companies for whom JPA compliance is a higher priority. The least that should be done IMO is to adequately document this abberation, so other developers are not tripped up like I was. But anyway, on to the code. 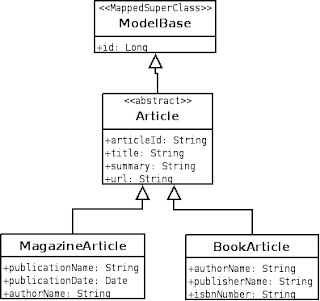 Since I was using MySQL, I decided to build a ModelBase object which is annotated as @MappedSuperclass, and which specifies the id type and generation strategy. JPA can work with legacy ids, but it is considerably more work to implement than autogenerated surrogate keys, so I decided to keep things simple. In any case, if we decide to switch to some other database, all we would need to do is change the id generation strategy in this one class (and the provider in the persistence.xml class). The above class is marked as @MappedSuperclass, so there is no corresponding table in the database. The next class is the main Article class, also abstract, since we don't want to use this as is, ever. For each content provider, we want to add in extra metadata unique to that provider. Notice that we have the @DiscriminatorColumn annotation. With Hibernate, this has absolutely no effect, and in fact, you don't even have to have this for InheritanceType.JOINED. The only time you need this for Hibernate is for single table inheritance. The subclasses of Article are shown below. As before, we don't need to have the @DiscriminatorValue annotation in either subclass, since Hibernate will not use it or record it. Here is a JUnit to insert data into this database structure. Most people would probably use DBUnit to do this, but my objective was to find how to insert data into the database using JPA, so I did a unit test. Notice how the code is pretty much unaware of the underlying database structure. It deals with Java objects, and the JPA entityManager does the work of creating and executing the SQL for it. In my code, I purposely kept the code as free of override annotations as possible, which may not be possible in real life. For example, your DBA may enforce a particular table naming or column naming structure. You can map beans to corresponding table names using the @Table annotation, and property names to corresponding column names using the @Column annotation. Another thing I noticed was that the performance of the JPA code is slightly slower compared to straight JDBC calls. However, this is expected, since JPA provides a level of abstraction that allows us to write more readable code, and does some generic heavy lifting behind the scenes that would be concievably less efficient than hand crafted SQL. I think this becomes less noticeable when we run the applications over longer periods of time and we are able to take advantage of the ORM's cache. Overall, I was quite impressed with JPA. The JOINED subclass strategy is conceptually nicer than the table per class strategy we have currently implemented using straight JDBC. With a JOINED strategy, we can enforce that certain fields will need to be populated regardless of a provider. It is also normalized, with no repetition of column names across individual tables. Often, the implementor of a new table will use different column names or column types, which makes it harder to work with the articles in a generic way on the front end. As for the learning curve involved with JPA, obviously there is one, but I forsee that JPA will soon be as ubiquitous as JDBC is today. Already, more and more Java shops are switching over to ORMs, and there are plenty of free and open-source products available which are as good as their commercial counterparts. Learning the JPA API will enable you to work with the JPA compliant ORMs out there, and now that it supports annotations, its just a matter of learning a few simple annotations to get going with JPA. I have written before about how much I liked the annotation driven persistence mechanism that BerkeleyDB Java Edition provides using its Direct Persistence Layer (DPL). I had an opportunity to look at it once more this weekend, this time with a view to persisting arbitary objects into Maps keyed by a unique String value. The objects to be persisted are arbitary in the sense that the caller of the persistence code would know for sure what objects need to be persisted, and would persist the same class of objects into a given BerkeleyDB store. However, the code that did the persisting would not know what objects it was working with until it was instantiated by the caller. To do this, we define a generic StoreEntity object that persists objects of type V.
The StoreEntity objects are persisted by a Store class which take care of initializing the database at startup in its init() method, and clean up resource handles in its destroy() method. It provides two methods getValue(String) to get an object of type V from the BerkeleyDB database and a setValue(String, V) to save the object V keyed by the String into the database. To use this, the client code looks something like this. Obviously, the client code would be better structured than this, probably pulling out the init() and destroy() calls out into its own init() and destroy() lifecycle methods, rather than lumping them together as shown below, but you get the idea. If you have read my earlier blog referenced above, the code here is virtually identical to the code in there. The only difference is the use of generics to make the code reusable regardless of the payload to be persisted, without having to repeat all the boilerplate code that is needed to initialize the BerkeleyDB store. My next step was to try and make it configurable using Spring, which is where I ran into issues. I wanted the client to be able to configure multiple such stores, each servicing a particular data type (Java objects, custom objects, or collections of either) by specifying the class name of V and the name of the subdirectory where the data should be persisted. Passing in the class name of V was an idea I got from this IBM Developerworks article - "Don't Repeat your DAO". However, I could not find an easy way to build a Store<Whatever> object using the Class.forName() mechanism, where Whatever could either be a simple Java object, such as String or Integer, or a custom Java object, or a Collection of Java objects or custom objects. Gafter's Gadget looked kind of promising, but wasn't exactly what I was looking for. From what I have read from other posts on this subject, what I am trying to do is probably impossible in Java at the moment. Basically, using Class.forName() style calls to reflectively build a class instance whose class name is known is not that simple with generic objects. So generics gives you flexibility at compile time, while Class.forName() gives you the same flexibility at run time. Apparently, you can't have your cake and eat it too. Of course, I could just implement the factory in code, with a Map of store names and corresponding Store implementations, which I could set up at application startup. However, I would rather not do that if I can help it. If anyone knows of a good way to do this, or know of resources you think might help, would appreciate you pointing me at them. This post contains some settings I use for remote debugging web applications using the Jetty and Tomcat containers, and profiling web applications deployed on a remote Tomcat server, using the Eclipse IDE. By remote I mean connecting over a socket, the container can (and does in my case, unless I am connecting from home) listen on a port on the local host. The stuff here is hardly original, it has been gleaned from various web pages and blogs, which I reference in the appropriate places. If you use (or are considering using) Eclipse and want to know how to do remote debugging and profiling, this information may be of some use to you. I have been using the Eclipse IDE (with the MyEclipse extension) for about 3 years now. Most of the time, when debugging, I just use logger.debug() calls within the code to see whats going on. I do know how to debug using the Eclipse Debug perspective, but I guess its just a habit I developed, and old habits die hard. I don't even use Eclipse's CVS perspective anymore, based on some bad experiences at a previous company where I tried but ended up inadvertently removing from CVS code that I removed locally in my IDE (it was incorrect usage on my part). However, lately, I am starting to find debugging very useful, mainly because of the long stop-deploy-start cycle for our main web application. Unlike a lot of IDE users, I like to run my web container from the command line rather than from the IDE. This is because of two reasons. First, I think the primary goal should be being able to build a WAR file using Ant (or Maven) and being able to deploy to a container. A lot of IDEs make you go through various hoops to make the webapp "compliant", where the definition of what constitutes compliance can vary from IDE to IDE. As an Eclipse user, I have been a minority at my last two jobs, where the majority of Java developers use IDEA, so it usually turns out that I have to make Eclipse comply with what IDEA thinks is a webapp. Second, having to stop and restart the app within a container running within your IDE involves using your mouse (or in case of a laptop, your touchpad), which is way less convenient than the command line with command-history enabled. We run and develop our main web application using Tomcat. I have been building Maven apps for quite a while now, and I tend to use the Maven-Jetty plugin because its so much more convenient. For Maven webapps, I tend to do most of my development using Jetty, then deploy to the Tomcat server. The upshot is that I need to be able to debug using remote Tomcat and Jetty instances. The information here is from the Tomcat FAQ Wiki. Basically, you add this in to the $CATALINA_HOME/bin/setenv.sh file. My CATALINA_HOME is at /opt/apache-tomcat-5.5.25. If you already have a JAVA_OPTS defined for application-specific stuff, just add the stuff below to your JAVA_OPTS. Connect Allow termination of remote VM No This is really your choice, I just don't want it. Common Display in Favorites Menu Yes This adds the config as a bookmark under the debug icon. Deploy your app to the Tomcat container and restart Tomcat. In Eclipse, switch to the Debug perspective and a breakpoint in in your code (say a controller you want to call). In Eclipse's Debug perspective, [Alt]-[Shift]-B allows you to set (or unset) breakpoints at particular points in your code. Open up a browser and point to the page you want to debug. Bringing the page up will activate the debugger in Eclipse and you will see the code where you set the breakpoint being highlighted, with the top right corner containing the variables to be inspected. You can use [F6] through [F8] keys to step over, into and out of breakpoints. You probably know how to take it from here. Information for this comes from Dan Allen's blog post Remote Debugging with Jetty. Unlike Tomcat, this time you have to set the debugging parameters within MAVEN_OPTS since Maven runs its classworlds Launcher instead of Java. The MAVEN_OPTS need to be set in your configuration (either in your ~/.bash_profile or in a shell script that calls the mvn jetty6:run command). As before, if you already have other stuff in your MAVEN_OPTS, the stuff below needs to go after that. On the Eclipse side, the setup is identical to the Tomcat setup described above. Simply change the name (mine is called Jetty (Pluto:8081)) and the port number of the listener to what you set it to in MAVEN_OPTS (mine is 8781). Recently, I needed to profile a web application I wrote. It was taking 4-8 seconds to serve a single page on a production class machine, compared to an expectation of about 40-80 milliseconds. Response times on my much less powerful development box, while not 40-80ms, were tolerable. My initial reaction was to put StopWatch calls within the handleRequest() method of the Controller, timing the blocks which I thought could do with improvement. That detected some places where it was spending more time than I thought it should, so I fixed those, but the pages were still dog slow on production. Moreover, it seemed that response times were degrading under load, and load on the database machines was spiking so as to make them almost unusable. What I needed was a profiler, but I did not know how to set one up, much less know how to run it and interpret the results. However, good things sometimes happen to bad programmers, and our local performance guru was kind enough to set up a profiling instance on his Netbeans IDE (he is an IDEA user, but he uses Netbeans for its awesome profiling tool) and run a profile for me. It did identify several more hotspots in the code that could be optimized, and I fixed them. The performance did improve somewhat as a result, but we were still seeing spikes on the database machines. The problem turned out to be contention for the same database resource with another web application, which I figured out by just thinking through it and looking through the code. However, the profiler output helped me weed out the unnecessary stuff quickly. So although the best way to find performance problems is still, in my opinion, just trolling through code coupled with an understanding of the program flow, a profiler makes the process much faster, because it has already told you what you are not looking for. While I now know (thanks to the same guy who helped me out with the performance numbers before) how to do profiling with the Netbeans IDE, I wanted to do this from within Eclipse using the TPTP plugin, so what follows is my setup for doing that. Information from this comes from this profiling java blog post, which has a link to a Eclipse-TPTP setup Howto on Windows XP, which I adapted for my use. TPTP needs a client component to be installed in the Eclipse IDE (the TPTP plugin), and an agent component RAServer which mediates between the performance data from the Tomcat server and the Eclipse TPTP client. Huge amounts of profiling data are transferred as XML documents, so using this from a remote (not localhost) client is very slow. Therefore, three things need to be setup to use TPTP to profile remote apps under Eclipse. First, we need to download the TPTP plugin. If you are using a recent version of Eclipse (I am using 3.3.1.1) then you can get the plugin from the Europa Discovery Site. Simply click on "Help > Software Updates > Find and Install > Search for new features to install", then select the Performance and Monitoring features and click on "Select Required". This will download the TPTP plugin to your IDE. Restart your IDE to see the Profile icon on the toolbar, and "Run > Profile..." entries in your menu. The complete procedure is explained in detail in the Installing TPTP using Update Manager page. Second, we need to install the agent component. This is available as a separate download for the particular architecture and operating system from the TPTP home page (scroll down to Agent Controller). Here is a link to the one I used. Setting this up was easy, but not totally straightforward. The first step is to unzip the download into /opt/tptpdc-4.1.0, then set up the following environment variables in your ~/.bash_profile and source it. Here is the snippet from my ~/.bash_profile file. Finally, we need to set up the JAVA_OPTS environment variable in the $CATALINA_HOME/bin/setenv.sh file, like so. Also, since we are starting Tomcat with the profiling instrumentation enabled, I found that it would complain about missing libraries, which went away after I added the RASERVER_HOME paths to PATH and LD_LIBRARY_PATH to the setenv.sh file. To start using profiling, I deployed the web application to Tomcat, started RAServer, then started Tomcat. On the Eclipse side, I built a Profiling Launch configuration by clicking "Run > Profile", then right-clicking New on "Attach to Agent" on the left pane of the resulting dialog. Here are the settings for my IDE. - Name WWW (Pluto:8080) Can be anything. Mine says what and where. Hosts Default Hosts Added pluto.healthline.com:10002 localhost:10002 was already there and could not remove it. Adding the new one and selecting it makes that the current host. Agents Available Agents Click on Refresh to get the standard Agent exposed by RAServer and select it. localhost:10002 was already there and could not remove it. Adding the new one and selecting it makes that the current host. Common Display in Favorites Menu Yes Makes the configuration appear when the Profile icon is clicked. Once this is done, switch to the profiling perspective. If the agent has been discovered, Eclipse will attach to it and start collecting statistics. Since a web app's job is to serve pages, what I do is to aim a URL generating script at the application. Here is an example of a Python script that reads a list of URLs from a text file and hits the app with the URLs. print "Usage:" + sys.argv + " www.myhost.com:80 /path/to/urllist"
Once the script completes, you can stop the profiling. I was able to generate three reports from it - Execution Statistics, Memory Statistics and Coverage Statistics. Of these, I found the Execution statistics the most useful since it told me how many times a method was called, and what processing time on average was spent in each of these methods. Undoubtedly I will find more use for the other reports in the future, but for the moment I am happy to have profiling working under Eclipse. To start a normal session, I just call jetty.sh, for debugging and profiling, I call jetty.sh debug and jetty.sh profile respectively. On the Eclipse side, I create a profile configuration in the same way as for Tomcat, by attaching the profiling client to the running Java application. The RAServer detects the Java app that is exposing profiling information, and automatically discovers it. This post was republished by the folks at SYS-CON Media in their Open Web Developer's Journal and is available here. Goes to show that one should be careful about what one writes, it may end up anywhere :-). Thanks to Jeremy Geelan for making this happen. Here Point(x,y) is a user-defined data type that represents a point in 2D space. Since then, many open source and commercial databases, such as Postgresql, MySQL and Oracle and probably many others have already implemented spatial extensions. One great use case for these is in geographic search, where users enter their location in the form of an address, and which is looked up in some sort of database like the Tigerline database from the US Census Bureau, and then used as a base for searching for certain types of businesses "close to" the origin. Recently, on what is possibly my n-th time reading Eric Hatcher's "Lucene in Action" book, I came across an example of doing this with Lucene. I thought I'd try to build some code to do this as per the recommendations in the book, which is what this post is all about. First, I build the input and output beans. The GeoPoint is a represents a point on the earth, and is instantiated with longitude and latitude values. It also has methods for normalizing the values for ease of searching with a Lucene RangeQuery and a method to calculate the distance between two points using Pythagoras' theorem. The GeoResult represents the object that the search results would populate. * Simple bean to represent a single point on the earth. * Bean to represent results of a GeoSearch. Next comes the GeoSearcher, which takes a GeoPoint object, and the distance within which to search. It will build a BooleanQuery consisting of two ConstantScoreRangeQuery (this is an improved RangeQuery object, new in Lucene 2.2) objects, one for the latitude range to search, and one for the longitude range to search. The GeoPoint.normalize() method is used to add 90 to the latitude values (so the South Pole is at normalized latitude 0 instead of -90 and the Equator is at normalized longitude 90 instead of 0) and 180 to the longitude values (so the International Date Line is at longitude 1 instead of -180 and the Big Ben is at normalized longitude 180 instead of 0). It also pads the rear and front of the number with zeros so the RangeQuery can work with it. However, the values returned fall into a square, so we need to calculate the distance along the hypotenuse using the GeoPoint.distanceFrom() method to make sure we only consider results within the circular covered by points within the specified distance from the origin. There is one major (incorrect) assumption here. One of them is that the earth is flat (a view popular among the scientific community in the 15th and 16th centuries), so the distance between two longitude values is considered the same regardless of which latitude the origin is on. Obviously, the further you get away from the equator, the closer neighboring latitudes get, and at the poles, there is no distance at all. I could not find the math to calculate this, and I was too lazy to figure it out, so I just put in a placeholder method calculateKilometersPerLongitudeDegree() which returns the same constant value as the kilometers per latitude. * the specified distance (in miles). // sense to have them as query filters, since they are cached. * Method to close the searcher from client code. * @exception IOException if one is thrown. * @param origin the GeoPoint object corresponding to the origin. * @param distanceKms the distance in kilometers on each side of the origin to search. * @return a BooleanQuery containing two RangeQueries. * @param latitude the original latitude. * @return the kilometers per degree between longitudes at that latitude. * Convenience method to build a GeoResult object from a Lucene document. * @param doc the Lucene document object. * @param point the GeoPoint object for this result. * @param distanceKmFromOrigin the calculated distance from the origin. * @return a populated GeoResult object. My first approach, which I call naiveSearch() above, is to simply build the Query and hit the index with it. I then iterate through the Hits returned, applying the distanceFrom() predicate to each result, and discarding results that are not in the circle defined by the origin and radius. Since my use case would be to force the user to specify a category, I don't get too many results after applying the category filter (maybe in the region of 20-30 results), so I just use Java Collections.sort() with a custom Comparator to return the values closest matched points first. The category filter is a regular Lucene QueryFilter object, which is cached lazily. Since I expect to have a finite number of categories, it makes sense to have these be built and applied to the resulting Boolean RangeQuery instead of shoving the category query into the BooleanQuery, since that would be calculated every time rather than filtered against a cached (after the first time) BitSet. Why did I do a Collections.sort() rather than use a custom Lucene Sort object instead. Well, I have used SortComparatorSource implementations in the past, but I have had performance problems with them. In retrospect, I understand I used them incorrectly, applying them against the entire resultset returned from a Query instead of using the approach recommended in the Lucene book. Also, I was a little concerned about having to instantiate a Sort object for every query, since I can't sort on the distance unless I know the origin, which changes per query. Anyway, the recommended approach seems to be to get a TopFieldDocs from the searcher, limiting the result count. The book says thats the only way to use a Sort object in the query. I am guessing that used to be true for version 1.4 (which is when I bought the book), but is no longer true. The implementation in the book also pre-sorts all distances from a given location, so my implementation, which calculates distances per query, is probably unlikely to perform much better than the naive approach. Anyway, at least I got to work with the TopFieldDocs object. * Custom Sorting for Distance calculations. I tried the above methods with 3 queries each, using the same origin point, and hitting it successively for 5, 10 and 20 kilometers with different categories to filter. Based on that the recommendedSearch() is about the same, performance wise, than the naiveSearch() method, clocking in at around 300-500ms on my laptop. If any of you can see issues with these approaches, or can think of opportunities to tune the algorithm, I would appreciate knowing.